Mark Meadows Townhomes for sale are a small cluster of homes on Broken Lance Drive in the quiet Breckenridge neighborhood of Warriors Mark. Built in 1983, these units are large - more than 1500 sq. ft. - have a small walkout basement, and one-car garage. The floorplan is open, and the windows floor to ceiling and offer a nice view of the Breckenridge Ski Resort. Because the living room faces west, and they are located near the valley floor of the Blue River these homes will get long afternoon sun. Learn more about this Breckenridge community, or start your search with the Mark Meadows townhouse listings below. On the south side of Breckenridge, any Mark Meadow Townhomes for sale will be easily accessible from the Highway 9, and particularly advantageous as a ski, or second home, for people from Colorado Springs or other points south. There are trails through the woods that lead to national forest from this part of Warriors Mark, the free shuttle bus stops nearby, and Broken Lance is a pleasant street to walk along to downtown Breckenridge. Warriors Mark has a community greenspace near the Blue River, and fishing is permitted for residents. HOA: $1,000 year and includes Common Area Maintenance, snow removal and trash. Amenities: in town, short walk to downtown, small cluster of town homes, near trails, on bus route. From the southern stoplight in Breckenridge turn west on Broken Lance Dr. into Warriors Mark, drive to 756 and the town homes will be on the left. 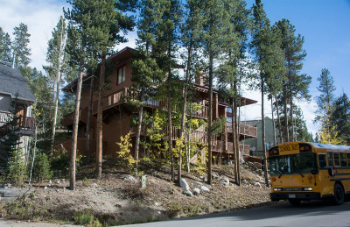 Confused about the myriad of real estate opportunities in Breckenridge? We've got your covered - talk to an expert today!